The term “soil health” has been generating a lot of buzz as we explore options to develop sustainable vegetable production systems. Based on the definition by the United Nations Food and Agriculture Organization, soil health is the capacity of soil to function as a living system, with ecosystem and land use boundaries, to sustain plant and animal productivity, maintain or enhance water and air quality, and promote plant and animal health. It is important to realize that soil is a living system and activities that affect soil have the potential to detrimentally affect its health. From the standpoint of soil, there are three main categories of soil health indicators: chemical, physical and biological. All three indicators are critical for optimum soil health and influence various functions. The table below shows the relationship between indicator type and soil function. Vegetable production follows an annual cropping system where planting and harvest takes place within one calendar year. Excluding vegetables like asparagus and rhubarb, most vegetable crops are planted late-spring to early-summer and harvested throughout the year based on their horticultural maturity. Vegetable cropping systems are intensive and often include practices that disturb soil such as primary tillage, incorporation of fertilizers and herbicides, laying of plastic mulch, cultivation to manage weeds, hilling and harvest. 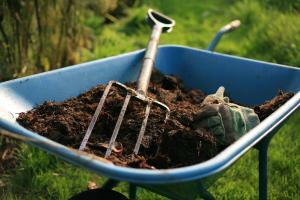 Activities that disturb soil affect soil organic matter and ultimately, the overall health and well-being of soil. Above mentioned practices such as tillage, cultivation, etc. decrease soil organic matter and could negatively affect biological activity in the soil. That being said, it is not practical to completely eliminate those practices as they are important and critical in many ways to establish and maintain high yielding and high quality vegetable crops. So is there a plausible solution to this conundrum? Yes, there is. Taking a balanced approach where emphasis is given on increasing or maintaining organic matter, improving soil structure and drainage, sequestering carbon, suppressing soil erosion, and practicing crop rotation, will significantly improve soil quality and health. Compost and/or manure - Composts and manures are applied to agricultural lands as a source of plant nutrients, essential microbial populations, and as a source of organic matter. Composts have also been successfully used in vegetable transplant production. Organic fertility amendments such as compost and manure improve physical, chemical and biological properties of soil and enhance yields. Proper use of manure and compost in our cropping systems is essential from both a crop production and environmental standpoint. Poor quality compost (immature; not properly finished) can detrimentally affect plant growth by tying up nitrogen and producing harmful compounds that can stunt the growth or even kill sensitive plant species. Applying too low rates can lead to nutrient deficiency and reduced yields. On the other hand, excessive applications can lead to nitrate leaching, phosphorus runoff and excessive vegetative growth in some crops. Cover cropping - Cover crops can have a profound impact on soil health, as they add soil organic matter, enhance soil structure and fertility, improve water-holding capacity, suppress weeds, and reduce soil erosion. A range of crops can be used as vegetative cover, e.g. grains, legumes and brassica crops. Cover crops help support diverse and active soil biotic communities that serve as a foundation for biologically active soils. Legume cover crops, in addition to adding organic matter, add nitrogen by fixing atmospheric nitrogen through a symbiotic relationship with soil bacteria (Rhizobium sp.). Cover crops can be used to manage weeds in vegetable production systems. Cover crops suppress weed germination by competing or producing allelochemicals which suppress weed seed germination. Cover crops can influence weeds either in the form of living plants or as plant residue remaining after the cover crop is killed. Growers typically manage weeds by cultivation which disturbs soil and affects soil health. Using cover crops eliminates cultivation and result in enhanced soil biology. Crop rotations involve a systematic farm plan, where the crop planted in one field on the farm changes every year or every season. While soil quality derives from inherent parent material, climate, and topography, crop rotation also affects soil quality and health. More diverse crop rotations that include more crops in the rotation tend to have better soil quality. Longer crop rotations have been shown to improve the soil’s physical properties, decrease erosion, reduce nitrogen (N) leaching potential, improve soil organic matter, and provide competitive crop yields. In vegetable production systems, high N-demanding crops, such as sweet corn, can be planted in a field following a soil-building crop such as oats, barley, rye, wheat, hairy vetch, and red or white clover, due to their quick establishment, ability to over-winter, weed competitiveness, and ease of mechanical termination. Cereal crops generally result in higher levels of soil organic matter helping suppress weeds, immobilize soil nitrogen, and reduce nitrate leaching during winter months. Planting small grains and N-fixing cover crops together may be an effective management strategy to increase soil C and improve the N cycling processes, thereby reducing N leaching while maintaining robust yields. Vegetable production systems often rely on use of fertilizers, lime, and elemental sulfur for meeting crop nutrient demands and maintaining optimum soil pH. Care should be given to apply the recommended rate and nothing in excess. Over application of these products can affect soil nutrient balance, soil microbial populations and could lead to poor crop growth and yield. The practice of tillage is necessary for incorporation of fertilizer, compost, manure and crop residue, better seed to soil contact, and installation of plastic mulch. On the other hand, tillage is one of the major practices that reduce organic matter level in the soil. Each time soil is tilled, it is aerated. This stimulates growth and activity of aerobic microorganisms which feed on organic matter. This leads to faster decomposition of organic matter, resulting in the formation of less stable humus and an increased liberation of CO2, and thus a reduction in organic matter. Also, repetitive tillage breaks up soil aggregates, degrades soil structure, reduces soil water holding, and detrimentally affects population of soil fauna such as earthworms that contribute to nutrient cycling and soil structure. Suggested approach to balance the positive and negative aspects of tillage is to till only when it is necessary. Conservation tillage systems such as no-tillage and strip-tillage systems can also be utilized for crops such as pumpkin, pepper, and broccoli. Such systems need advance skills and knowledge and should be first experimented in a small area before being expanded to the entire production system. Soil drainage is determined strongly by topography - soils in depressions at the bottom of hills tend to remain wet for extended periods of time because they receive water (and sediments) from upslope. Waterlogged conditions can significantly reduce microbial population and diversity and impede nutrient cycling. A well aerated soil supports microbial health and ultimately health of the soil. Soil compaction also plays a key role in soil health as compacted soils have shown to contain fewer earthworms than non-compacted soils. Addition of organic matter in the form of compost, manure, and cover crops can alleviate soil compaction issues. Healthy soils maintain a diverse community of soil organisms that help to control plant disease, insect and weed pests, form beneficial symbiotic associations with plant roots; recycle essential plant nutrients; improve soil structure with positive repercussions for soil water and nutrient holding capacity, and ultimately improve crop production. In vegetable production systems that are mostly intensively managed, it is imperative to integrate practices that have a positive impact on soil organic matter and microbial populations.